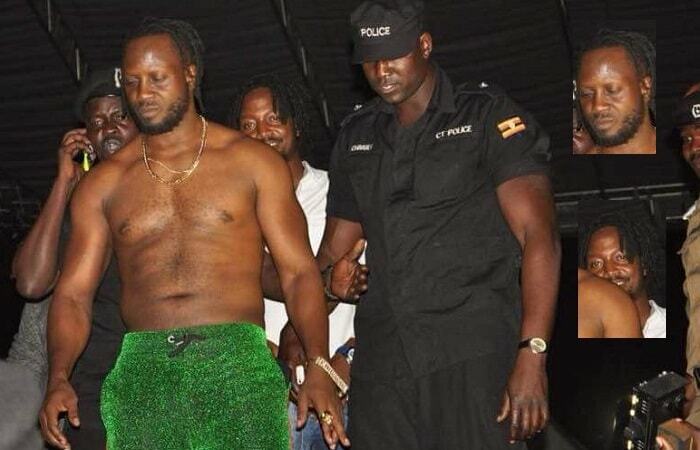 Today is Bebe Cool's birthday, but it started off on a rather sad note after he was pelted with bottles and booed off stage as he tried to perform his 'Love You Everyday' song. Bebe was part of the line up of the local artists that were performing alongside Jamaican-American reggae star, Tarrus Riley at Lugogo Cricket Oval as Swangz Avenue celebrated ten years. The fans did not allow him to even do a line of his song as they started shouting and all you could hear was #FreeBobiWine #FreeBobi Wine. It was not long before bottles from the crowd started flooding the stage, he thought it could stop, but the throwing of bottles and other objects lasted for at least 10 minutes, leaving the dad of six with no choice, but to take off backstage for his dear life. The 'Wasibukawa' singer was later seen being helped out of the venue guarded by two counter terrorism cops with his son and artist, Hendrik, who was following right behind him with a beaming smile. Minutes later, The Nkola Bya Fayo star took to Facebook to share pics of his family and wishing himself a happy birthday, he turns 41 today. "I am just a child when it comes to comparison with the big politicians in this country. My brain hasn’t even matured that much to understand the situation in Uganda," He said. "That is why at the end of the day there are fathers still running this country, because there is a lot we do not understand," He added. Bebe Cool has kept his 'cool' on the issue of his nemesis, Bobi Wine who was arrested on August 13 in Arua for treason after the President's car was hit with a stone that left its hind screen smashed. Bobi Wine was later granted bail on Aug 28 and, he together with fellow legislator Hon. Zaake tried to leave the country for further medication on Thursday, but were stopped. However, on Friday night, Bobi Wine was able to travel abroad with his wife and brother.